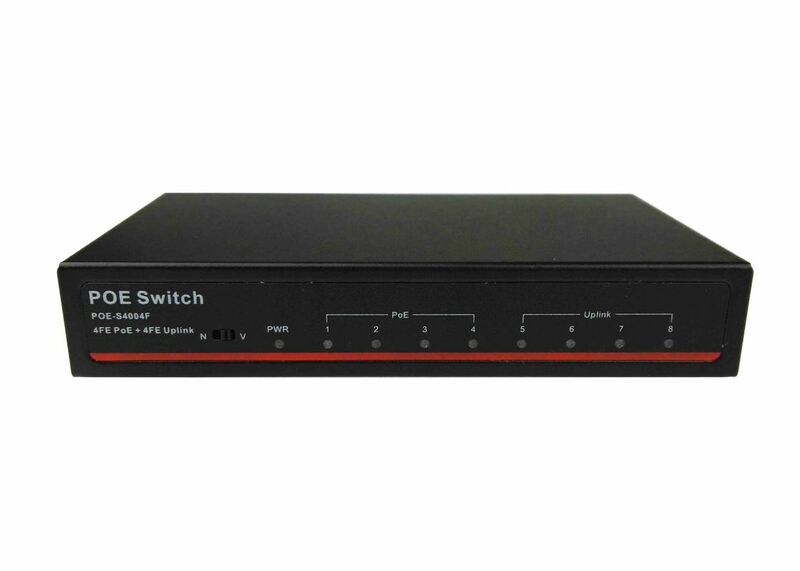 POE-S4004F is a 4 port Fast Ethernet Power over Ethernet switch with 4 port 10/100Mbps uplink, which enables it has more cascading solutions at the same time. It’s IEEE802.3af/at compliant and equipped with 65W external power source and widely used in Network CCTV, Portable Device, Wireless Access Point, IP Phone and other compatible powered device applied in network systems built in campus, hospital, government, hotel, office building, household and elsewhere requiring Ethernet power source. Meanwhile, every single PoE port has maximum 30W output and pass over Ethernet cable cat-5 least or those in higher quality such as Cat5e, Cat6, Cat6e, Cat7, etc., which will make sure less power lost in the the transmission towards to the terminal Powered Device. 4 10/100Mbps POE + 4 10/100Mbps uplink. Fluid Control: Full-duplex: IEEE 802.3x, Half-duplex: back pressure. Auto MDI/MDIX, Store-and-forward, 1.6G bandwidth. Max 30W for every single port, total rated output power 65W. Supports wire speed switching and jumbo frame up to 9KB transmission. Plug and play, self-adaption, lightning protection. Working status can be read and analyzed through corresponding LED indicators on front panel. 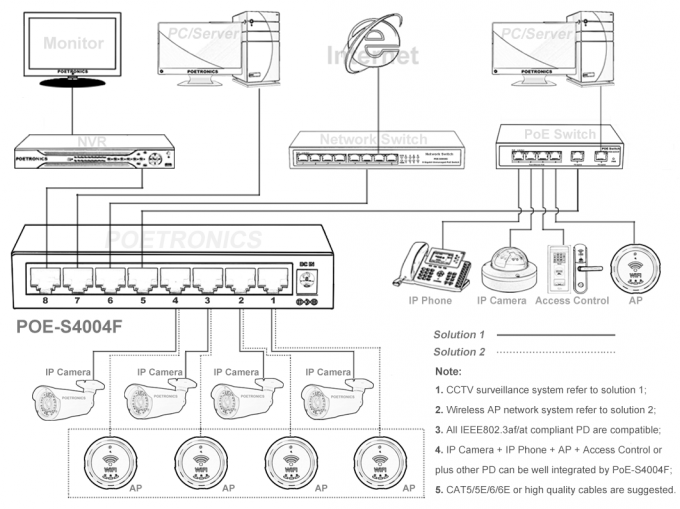 Applied to CCTV IP camera, wireless AP, VoIP phone, etc. System Setting D: Default free communication among all ports, apply to universal data exchange, 100-150m transmission distance. V: 1-4 PoE Ports VLAN isolating from each other, effectively restrain cyber storm, ARP virus and other network failure; Apply to wireless AP and other equipment.